Using the TOGAF Metamodel Part 1 - What is a Metamodel and why is it Useful? The EA metamodel is one of those things that you either hate or love. Those who are fans of the metamodel see a good metamodel as one of the major foundations for an effective EA practice. Others struggle to make sense of the TOGAF metamodel or grasp why it is needed, or how it is used. So, how do you get a metamodel that is effective rather than one that is weak or confusing? What does TOGAF provide that can get help you to create the metamodel you need for your EA practice? What can you do to make the TOGAF metamodel better? How can you supplement the TOGAF metamodel with material from other sources? And where can you find other sources? 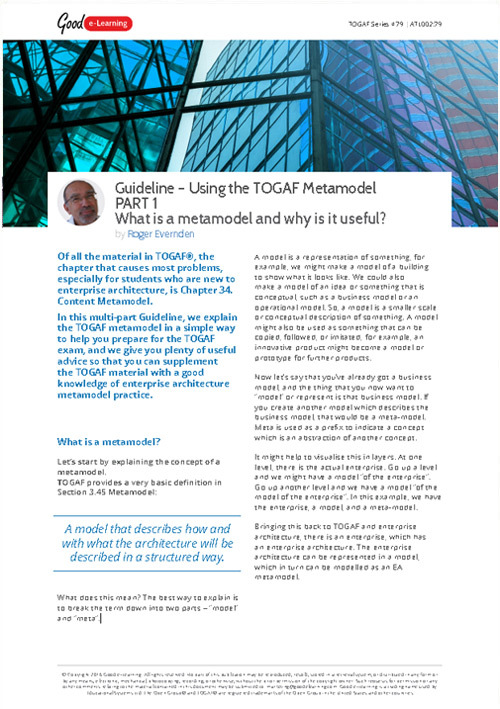 All of these questions and more are answered in our five-part Guideline – Using the TOGAF Metamodel. You might find our Poster "The TOGAF Metamodel - Key Points" a useful companion reference. Download part 1 of this five-part guideline by Good e-Learning’s enterprise architecture expert Roger Evernden today and you’ll also get instant access to over 500 business & IT learning resources!